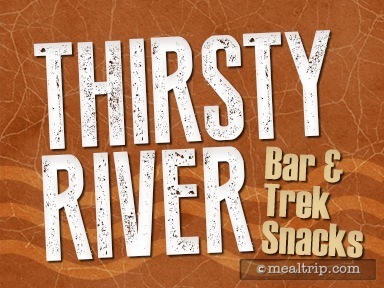 The Thirsty River Bar is located in what used to be the old FastPass building for Expedition Everest (the big roller coaster) in the Asia section of Animal Kingdom. There's a lot of detail work in the environment (they do like putting stickers all over everything), but very little actual seating, as this is more of a grab-and-go type of location. Notably, there are a few pastries available for breakfast (many of which are available throughout the day as well) along with a few savory Asian-inspired options for lunch and later. The term "Asian-inspired" is used loosely here as one of the main entrées is a Smoked Turkey Sandwich (try finding one of those at your favorite Chinese take-out place), a Roasted Pork Sandwich, and Shrimp in a box (finally, something that at least sounds Asian). Naturally, there's a few cocktails, mostly of the frozen variety, and some craft beers available, because you know... it is a "bar" after all.